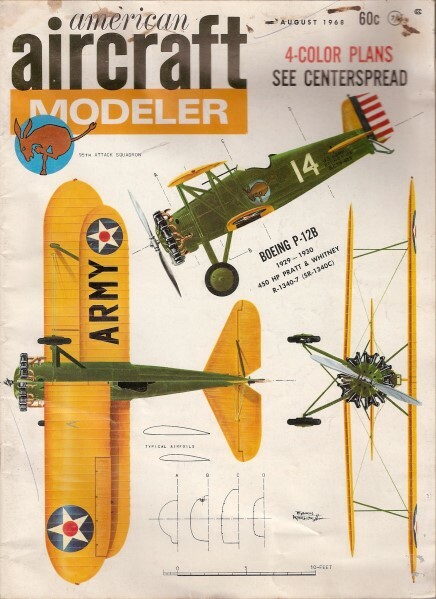 The article was scanned from the August 1968 American Aircraft Modeler (page 47). It has been out of print for decades, and is difficult to access unless you are fortunate enough to buy one off of e-Bay. Hopefully the original author won't mind that I have reproduced it here, but if he does, I will remove it. As with so many other aspects of technical application, the state of the art of rubber motors has advanced significantly since the writing of this article - not that the information contained herein is anywhere near obsolete (except trying to find Pirelli rubber). Rubber motor braiding techniques, lubricants, the rubber length, width, thickness, modulus, composition, has all been studied and characterized to the nth degree so most of the guesswork is gone as far as the actual motor performance is concerned. Still all the other variables in the airframe and propeller system (prop, bearing, gearing) make rubber free flight a true sport whose success is still highly dependent on the skill set of the flyer. Unlimited design by Horton has enviable contest record of 11 trophies. Motor test procedures described in articles were used on this model. Rubber motors were stretched four times original length for a period of 72 hours. Cool, dark basement was convenient. Light has an adverse affect on rubber. Motors were made up to required length around nails in workbench. Additional nails at one inch intervals indicate permanent break-in stretch. After getting poor and varying results with several pounds of Pirelli rubber, we decided something was lacking in our technique. A simple straightforward test was needed to determine the physical state of a rubber motor. Such a procedure, useful while breaking in the motor, would also indicate its contest-life capability and serve, too, as an indicator of quality from one batch of rubber to the next. We decided to measure the force, in pounds, developed by a motor stretched to a fixed length. 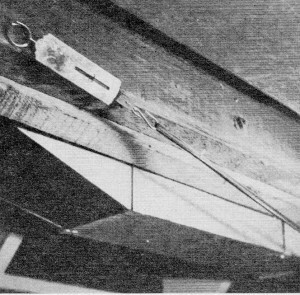 A simple spring scale measuring from zero to 50 pounds was purchased at a hardware store. Our Unlimited design motor, 18 strands of 1/4" x 1/24" Pirelli 32 in. long, was stretched to three times its original length, and readings were taken on the spring scale. 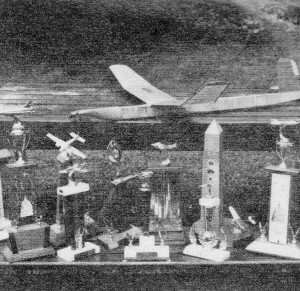 Throughout the contest season readings were taken not only after motor break-in but also after each contest flown with four of the motors. Chart 1 gives the force profile of these motors. 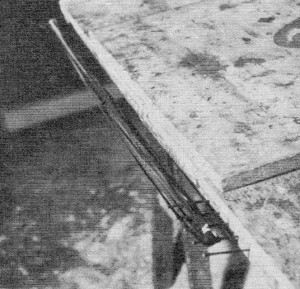 Standard, conventional break-in procedure was used - motors were stretch wound, increasing the turn count by 10% each time until the maximum turns-per-inch (18 in our case) was reached. Our results, as indicated on the chart, show that after a motor is completely broken in, the force line becomes constant. Armed with these readings we decided that, if motors could be broken in without winding, their useful life could be extended. To reduce erratic results a controlled stretch method was used. Motors were stretched four times their original length and readings taken with the scale at 24-hour intervals. We were amazed to find that it took three days to break in a motor. At the end of this period, "controlled-stretch" motors were giving the same tension force readings as those obtained from broken-in motors of the previous contest season. 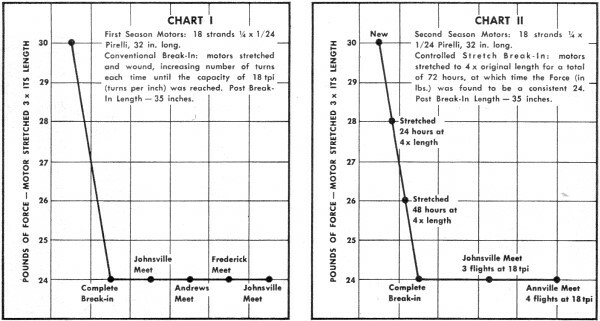 Permanent stretch was also the same - motors increased their length three inches, from 32 to 35, after break-in. These motors have been used in two contests this past season and wound to 18 turns per inch on each flight. So far we have not broken a single strand and the force readings have remained constant. Chart 2 .gives the force profile of the motors used. Some interesting by-products resulted from this testing. At one meet last season, we had a real dud of a flight after making two .maxes. Naturally, we were ready to place the blame on a dead motor. A quick check with the scale indicated, however, that the motor was in perfect shape, shooting down another good excuse. Another interesting point was noted: it takes the motors 24 hours to fully recover from a winding to maximum turns. Readings taken immediately after full contest turns will not be the same as 24 hours later. All chart readings given here were made after this rest period in order to keep results consistent. It's amazing how strong the motors were; even after a season's flying, they registered the same tension force readings. In fact, motors were retired due to age rather than weakness. Strands popped, causing an excess of knots. One strong message was clearly given on the force charts. Motors cannot be wound to a contest turns maximum without proper break-in. Fresh Pirelli will develop high stresses and has been known to blow at 50% of normal turn capacity. Remember, this article is specifically for the motors we used. However, this procedure can be used to evaluate any size or length of motor. We feel these tests useful for the contest flyer. Charts compare both conventional and controlled-stretch break-in procedures over 2 seasons of competition. Force readings and amount of stretch were the same for each.